Freelance science writer, freelance copywriter, freelance editor, freelance proof reader, freelance press release writer and more. I have written about this before, but you know what’s been annoying me recently? Dodgy ‘academic writing’ projects. Just this week I was contacted by someone who asked me to help them with a college assignment. Before accepting the project, I messaged the buyer to ask for more details about the project, since they were pretty vague about they really wanted; I was also suspicious that they probably wanted me to write the thing from scratch. Funnily enough, the buyer didn’t message me back and the project offer expired, so it seems my suspicions may have had some grounding. Just to make things absolutely clear, here’s what I WILL do for students and academics, and here’s what I WON’T do. Co-write a manuscript article for a peer-reviewed journal submission provided I am either named as a co-author or credited in the acknowledgements. Why won’t I write or rewrite academic assignments? The answer is very simple: it is CHEATING. …‘cheating’ means an attempt to benefit oneself or another, by deceit or fraud. This shall include reproducing one’s own work or the work of another person or persons without proper acknowledgement. If an assignment or article passes Copyscape or similar ‘anti-plagiarism’ software tests, it doesn’t mean that it hasn’t been plagiarised – it just means that it probably hasn’t been copied verbatim from published work. However, if YOU did not produce the work yourself, you cannot say it is yours. It’s like someone pretending to be you in an exam, or stealing someone’s bank details so you can pilfer their account. Let’s get this clear – asking someone else to write something that you intend to submit as your own, original work IS plagiarism. And plagiarism is WRONG. What REALLY worries me, is the number of people who think that this practice is OK. I have lost count of the number of times that a student has asked me to write an essay for them. It truly baffles me. I worked bloody hard for my degree. I EARNED the right to be called a Bachelor of Science by doing all my own research, writing all my own essays, studying REALLY hard, and sitting my own exams. Cheating never even crossed my mind because, actually – you know what? – I wanted to be GOOD at my subject! I wanted to KNOW about biology, to UNDERSTAND science, to PROGRESS my future career with my intelligence and skill! Why would you even BOTHER going to university or college if you don’t want/can’t be bothered/don’t have time to do the work?! I do understand that some people have difficulties structuring an essay, or with spelling and grammar and that is why I do offer a second pair of eyes to check work for errors. Editors serve a genuine purpose; so-called academic writers merely fuel dishonesty. A quick Google search for essay writing companies came up with LOADS of companies offering this service. The sheer number seriously blew my mind – and, my god, they’re so cheap! From as little as $15 USD, students can receive a ‘standard quality’ assignment within a few days! How do they get away with it?! Some proffer a disclaimer stating that the essays provided are not to be submitted as students’ own work, but to be used for ‘research purposes only’ or to ‘help students with essay structure’. Pah, come off it! EssayTyper.com, a website that automatically creates an essay on your chosen subject using Wikipedia says, “EssayTyper uses a patented combination of magic and wikipedia to help you write your essay – fast! That said, please don’t ever try to use this legitimately. The magic part is not real… and that’s plagiarism.” Still, I wonder how many kids have turned in homework using this ‘handy’ tool?! Some companies openly convince students that it is not cheating to submit an essay that they have not written themselves. I posed as a student needing ‘help’ and logged into the Live Chat function at essayforme.com to ask if I could buy a biology essay. “We would be glad to do it” said ‘James’. But isn’t it cheating? “No it is not. The paper is 100% custom written and never again used or sold”, I am reassured. In response to the FAQ “Is this plagiarism?”, Write-my-essay-for-me.com even asserts that “Plagiarism involves the theft of somebody else’s work. You hire us to write original work for you, and that is exactly what we do. There is nothing plagiaristic about our service.” What?! 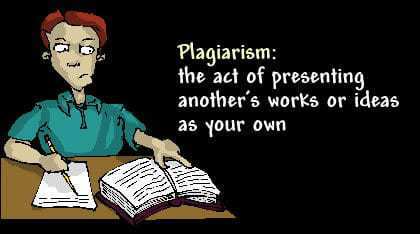 Yes, plagiarism involves theft of someone else’s work, but that’s not all! Even using someone else’s work WITH their consent, and passing it off as your own IS plagiarism and WILL get you in trouble if you are caught! Are you a student who has used, or considered using an essay writing service? Why did you do it? What results did you get? Did you feel bad about it? Are you a writer for an essay writing company? How do you justify your role? Do you work for a university or college and help to tackle plagiarism issues? What are your thoughts on essay writing services? I’d love to receive comments on this matter – am I the only one who understands the real definition of plagiarism? I agree. I would not write a paper for a student, because I worked hard to obtain my degrees. In addition, earning a degree means one has to demonstrate a certain level of proficiency and I do not want to become an accomplice to the awarding of an undeserved degree. In the past, I have had offers to write papers and it floors me to think that a student would not only expect a writer to write the paper, but do all the research involved in producing it. Helping a student through critique is the best way. Yet, in the end most students are not fooling their professors or the grad assistants. Really, what is the caliber of a paper that can be purchased for a few bucks? Or, the caliber of a student requesting such work? Those sites do not provide a service. To the contrary, they are a disservice. Except where specified, the copyright of all content on this website is held by Lisa A. Martin and shall not be reproduced or republished in any way without permission. If you like what you read, never miss a post. Sign up for email alerts here.